Our flight back to Honolulu wasn’t till the evening so we had plenty of time to do one last exciting thing in Hawaii – watch the sunrise at Haleakala. On our last day in Maui, we got up at around 4 am. Filled our thermos with vanilla Chai tea, put on a few layers of clothes, walking boots, borrowed a blanket from our temporary home and took off to the ‘House of the Sun’. 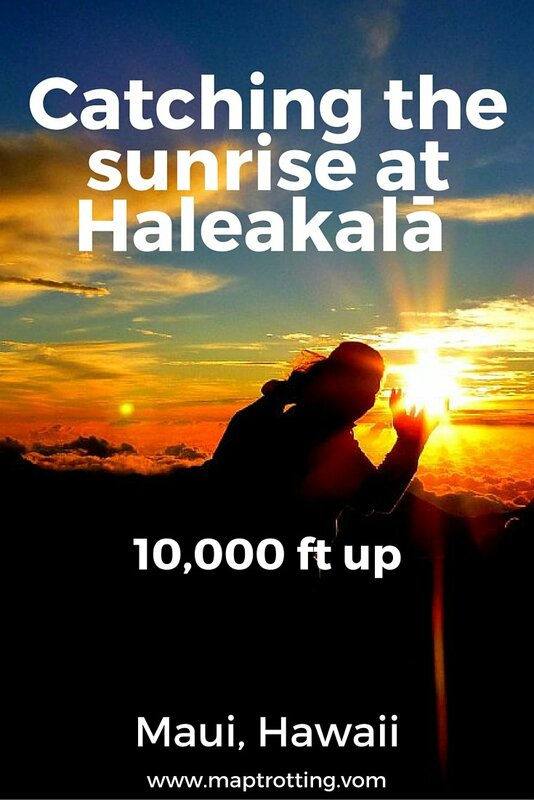 When trying to catch the sunrise at Haleakala, make sure you get there early, an hour before the sunrise, to get a parking spot. It gets really busy. It helped that we visited the volcano a day before, we knew exactly where we wanted to meet the new day. But standing just about anywhere will be an amazing experience. It’s really cold up there at 10,000 feet so make sure you have something warm with you. Not only it is freezing cold while waiting for the sunrise at Haleakalā, but pretty windy too. My face and hands were absolutely freezing, but it was totally awesome! It’s hard not to get emotional, watching the sunrise so high while thinking that something as breathtaking as this happens every morning, somewhere above the clouds. This was the best start of a new day! Pack some snacks, tea and coffee when getting up here, it will be nice to have a bite and warm up with a cup of hot brew. We surely enjoyed our tea! Sadly it was time to say our goodbyes and hop back to Honolulu. But what a grand finale to our perfect honeymoon on the beautiful islands of Hawaii. Hope to be back some day! Mahalo Hawaii! What a breathtaking sunrise of golden hues! We went to Maui on our honeymoon back in 2011. 🙂 It’s the perfect island for a honeymoon. Those sunrise photos are incredible. Glad you had an amazing time!